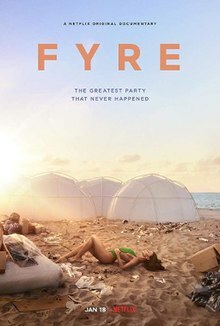 We watched the Netflix produced Fyre Fest documentary over the weekend. I remember the blow up on the social media when guests started posting pictures of the grounds and accommodations as they arrived. I had zero awareness of the event prior to the social media explosion in 2017 when it all blew up. I had no idea that Fyre was also an app that was going to disrupt the celebrity booking business. I always thought the whole thing was about the festival. I remember a lot of think pieces back when it all happened about what it meant for social media influencers and how FOMO played into and and whatever. Mostly I laughed at the displaced rich kids forced to sleep in a tent for one night and quickly forgot about it. It turns out a lot of the analysis was misplaced. Festival organizer and Fyre CEO Billy McDonald was just a garden variety grifter. If he had been of age in the 80s or 90s he would have been running penny stock scams. He was just a good salesman applying his talents to rip people off. It's a scam that goes back thousands of years. It is a highly entertaining documentary though.